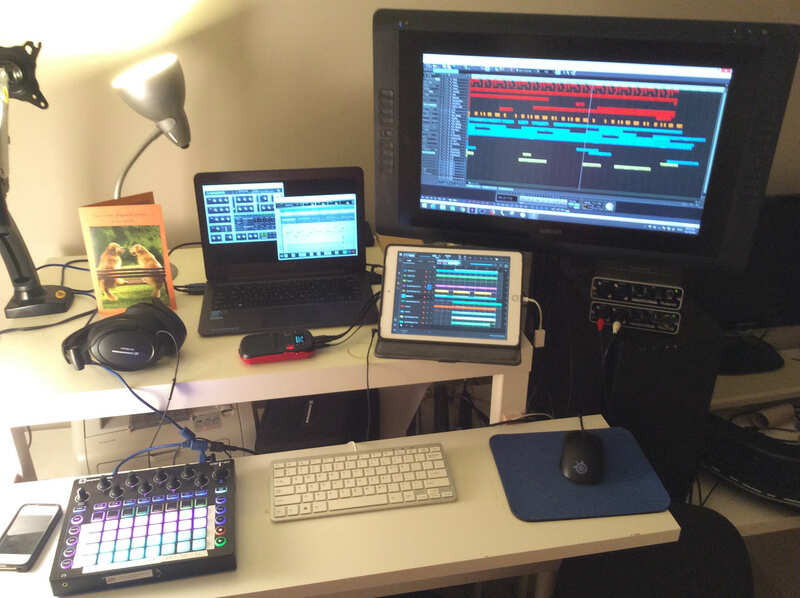 Another thread about gear made me realise that I’m pretty minimal when it comes to my iPad ‘studio’. Still, all the basics are covered leaving me free to focus on updating/expanding only the software-defined elements. 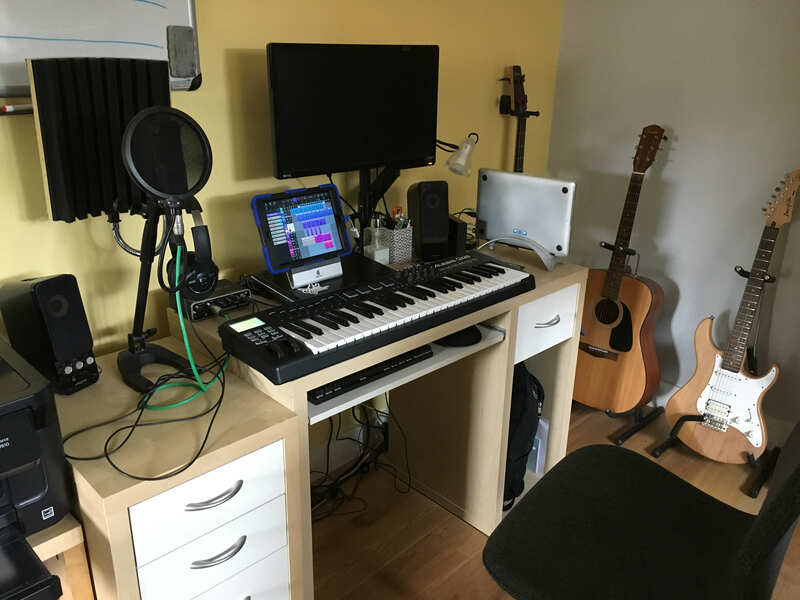 I’ve attached a photo - you’ll see I share the space with my work computer (laptop and MacBook are not involved in music making). Notice also no monitors! 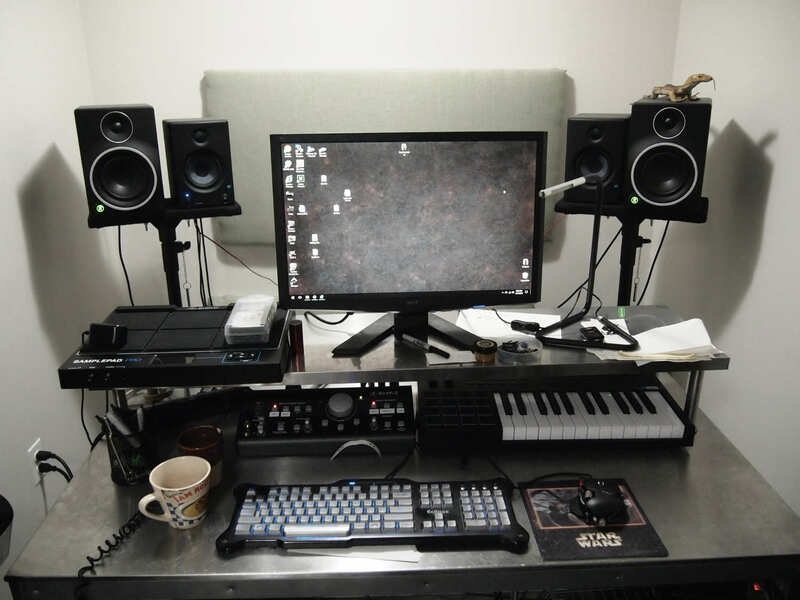 I have a pair of neutral KRK headphones for mixing (I do checks on various sets of speakers). 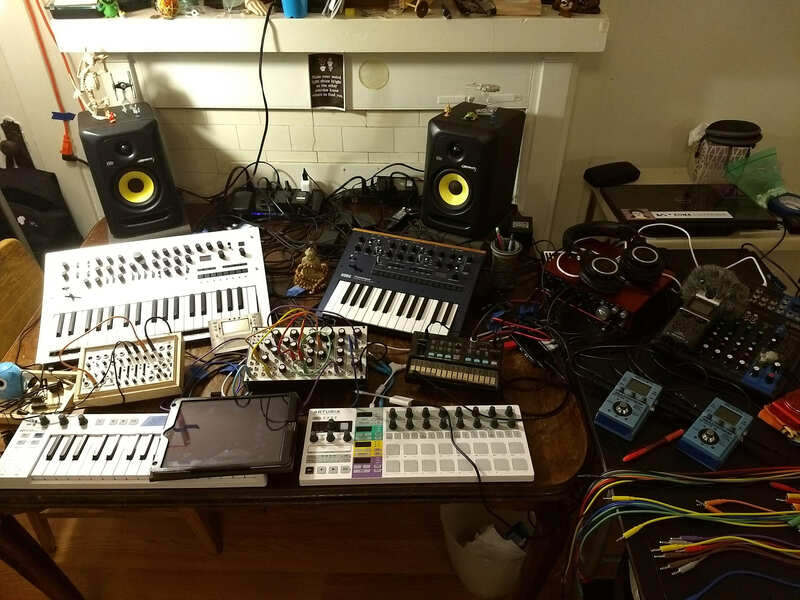 C’mon, share a photo of your setup for the forum! 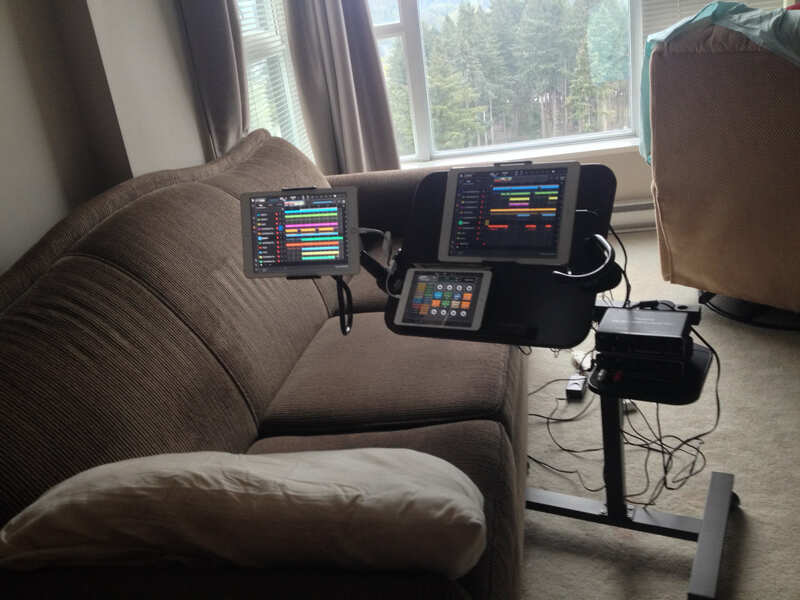 At this time, I am still just iPad and monitor speakers. 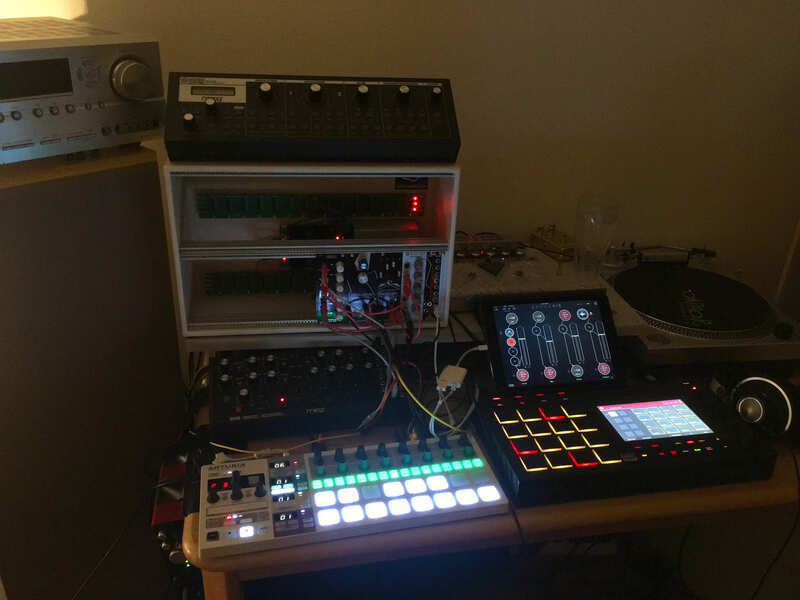 I will eventually need to add a mic and some sort of hardware controller. I just can never make up my mind. Another second hand iPad will be added soon. 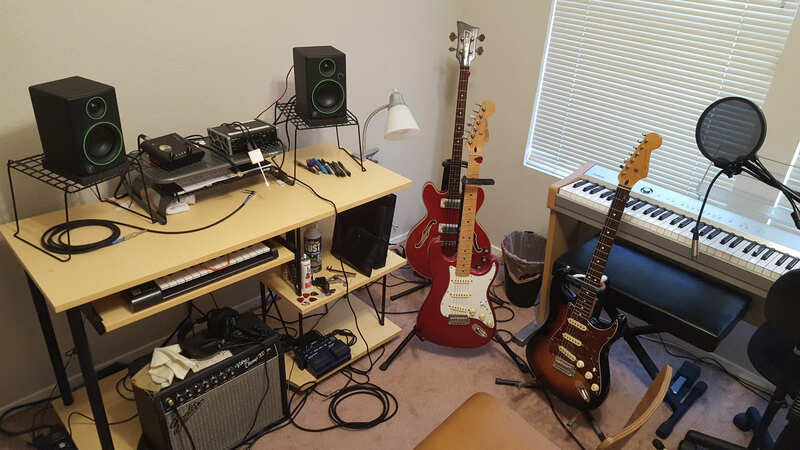 I have no studio at all. 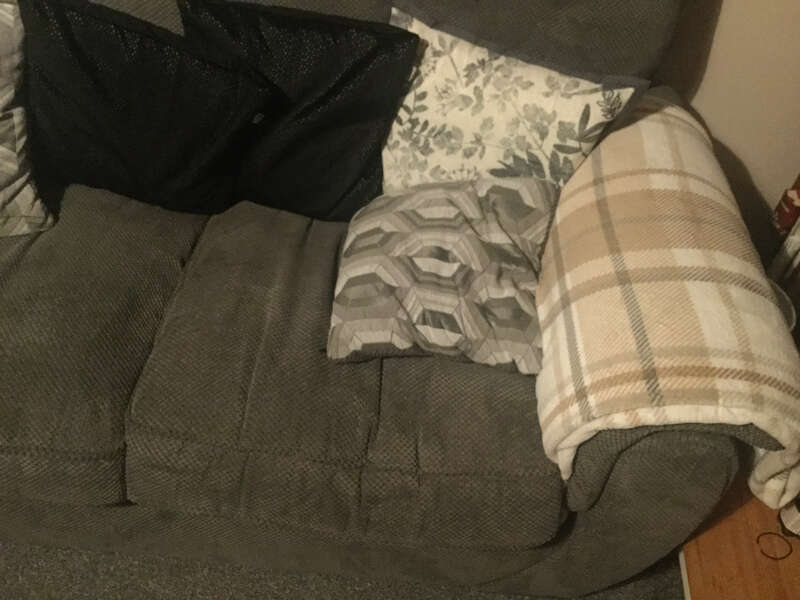 Just mostly the couch, macbook pro, iPhone and headphones. Ice cube bins to raise the monitor up a bit. Hey....it works and costs about $2. I also built the pedal board from spare parts from a satellite teleport I work at. I remember a few other threads about this. 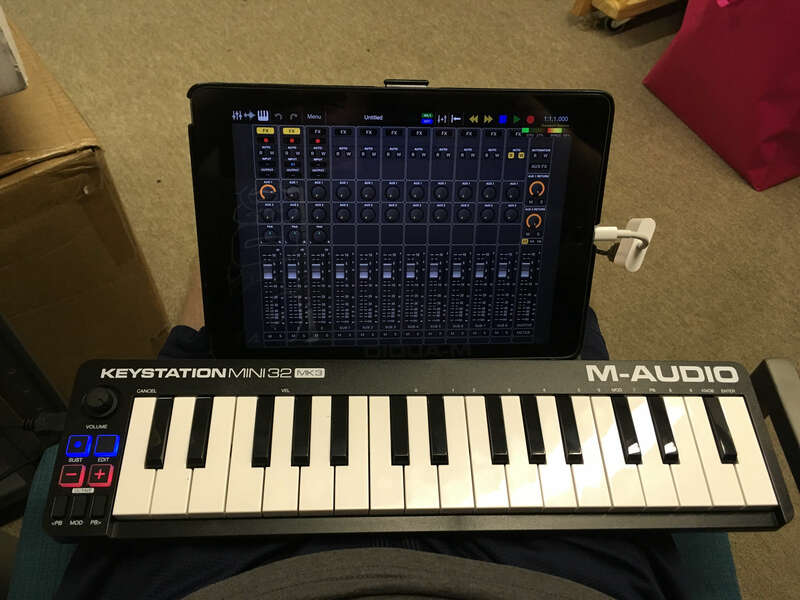 Lol, interesting how you mobile musicians have much bigger studios and more gear of what i would expect for a real "iOS musician"
Totally fake mobile musician here. The iPad is a new thing for me. But ive done a mobile musician thing for years (hollowbody jazz guitar and voice). 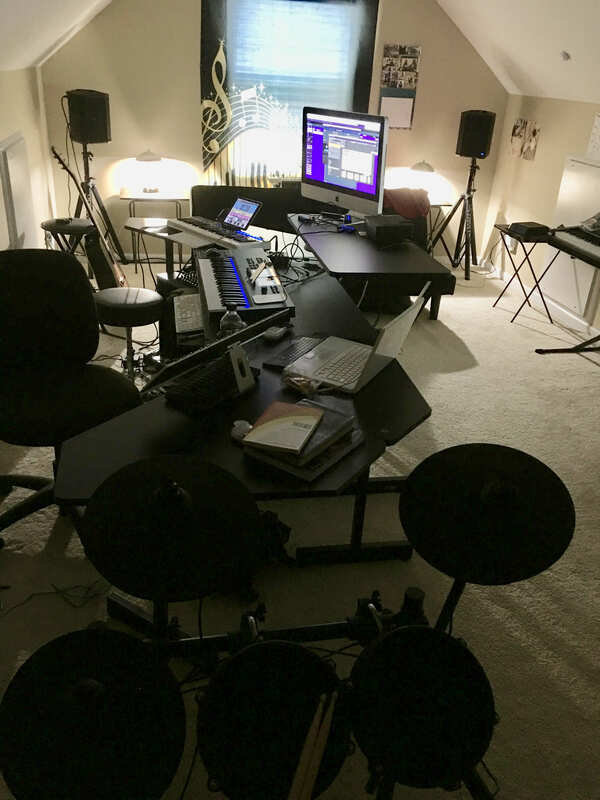 The iPad is for me is a drum machine, synth, song part sequencer. And all of that can be still portable live. 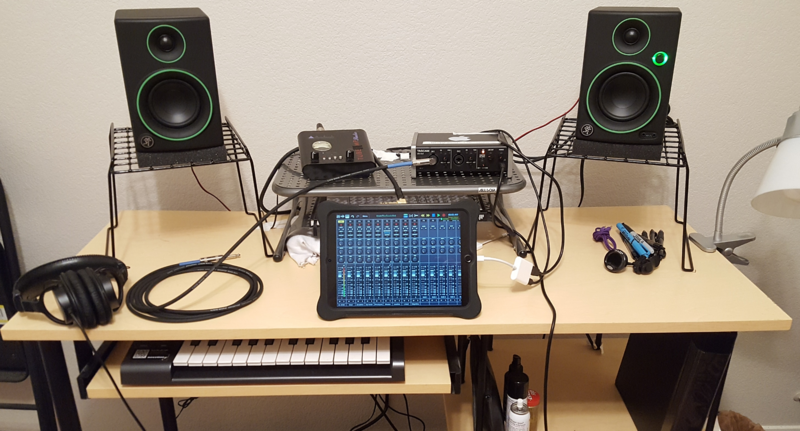 Have the iPad, usb hub, a couple midi controllers, and a mixer velcroed and wired onto a pedalboardesque setup. 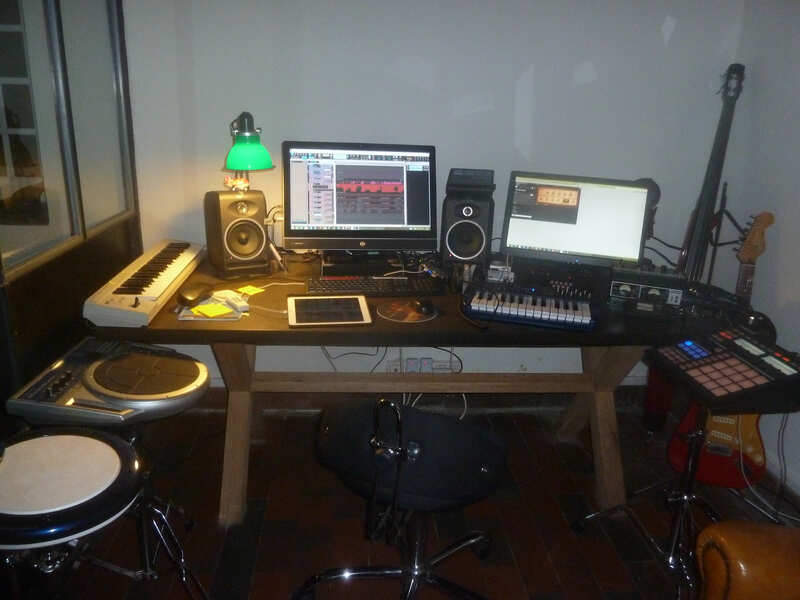 And writing and working on the songs, just need the iPad for that, which is a boon. 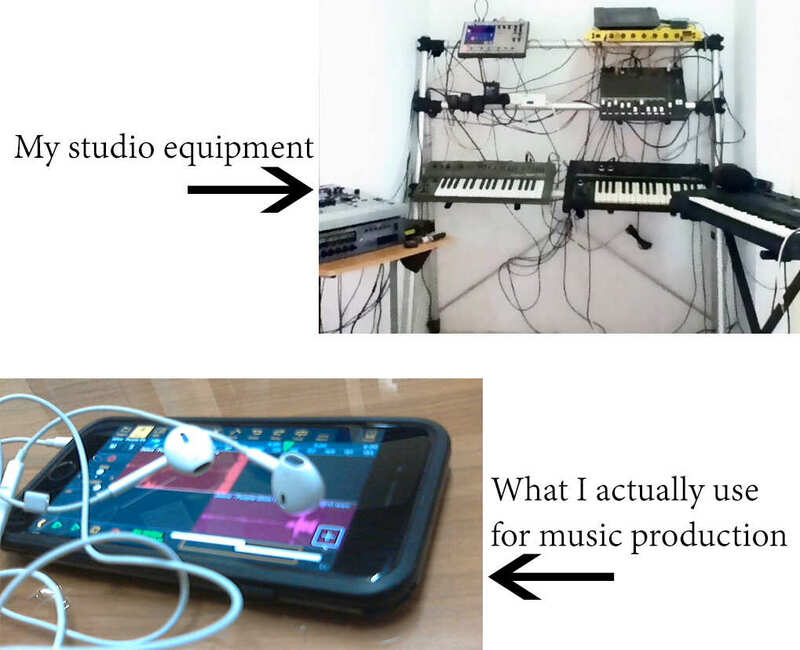 But all of those sounds can be enhanced with my very unmobile studio space. While I am not 100% convinced any non musician listener would be able to tell the real Moog filters I have in my room from Filtatron, or real amps from amp sims, I get easier results having a chance to hear these things loud in the room thru non frfr speakers. 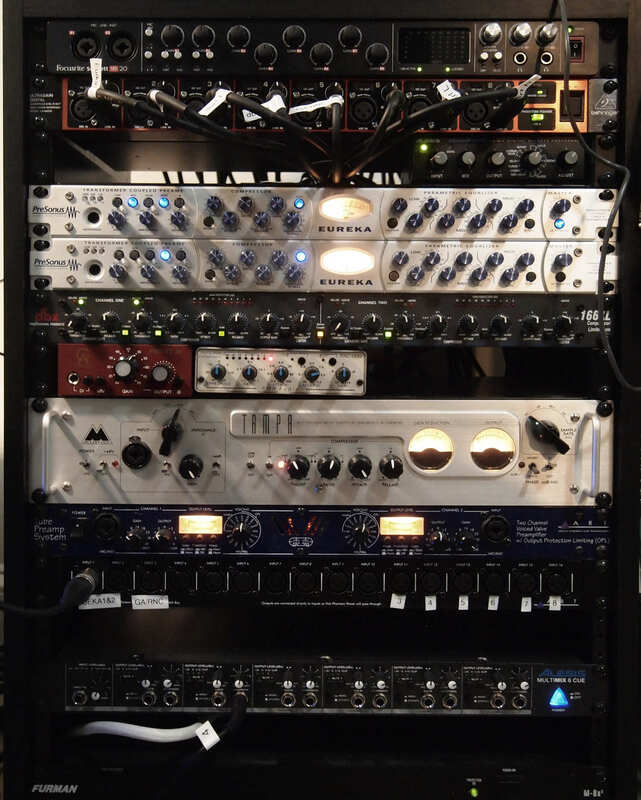 Some of the subtle tube and ss saturation effects from my rack I havent heard the equal to in iOS. Plus, Im still mainly a guitar player and singer. 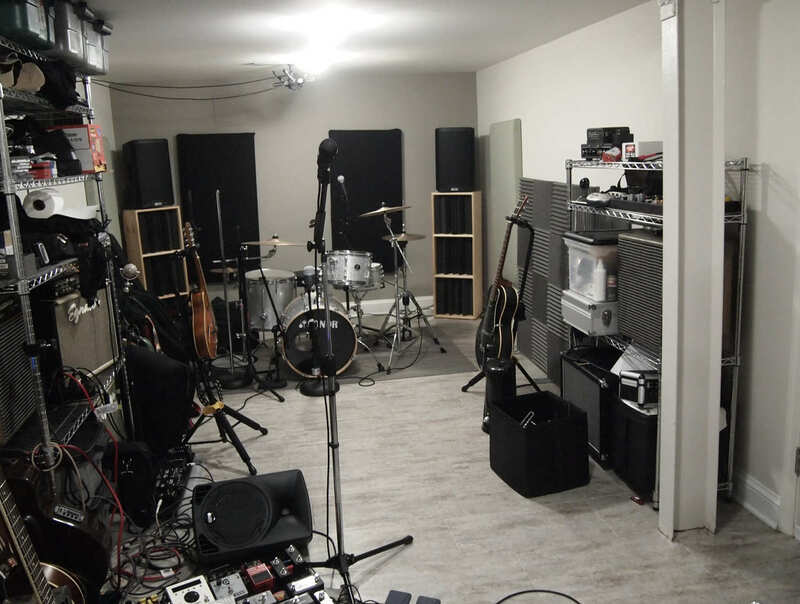 I need this little (sound proofed fyi) room just for marriage harmony. 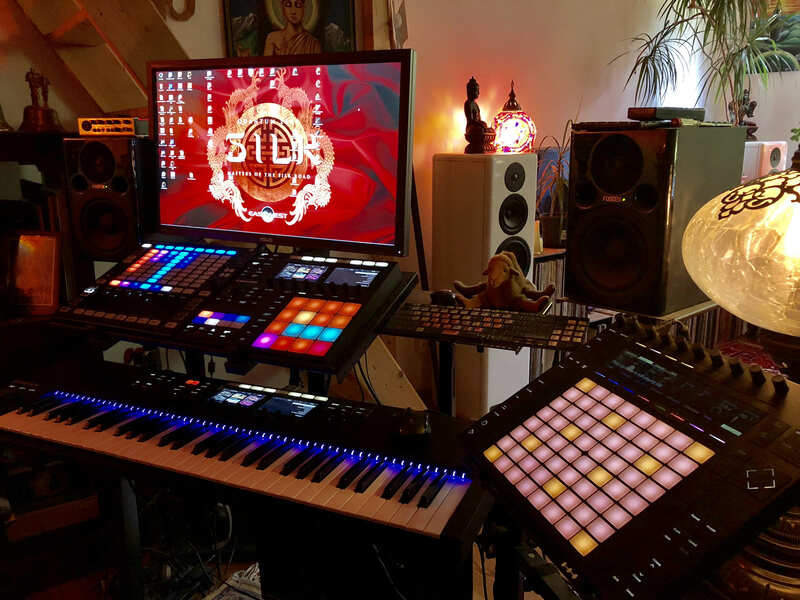 Where I make my bleeps and bloops. You must get a blast of cold air from the wind coming down the flue or hot feet from the fire! That mantle must come in handy. Love the setup. Ever hook your mini and monologue up for sync fun? I am alternating between these two setups this weekend. Mmmm, Silky background and the mystery of the stairs... interesting plants and ornaments... where in the world is this place? Yamaha A3000? I used to have one of those. @kinkujin I have a blast there. The mantle is full of pictures of my family. I like my creative space full of those that I love. @chandroji Seconded, keep your hardware. Some really nice setups here. 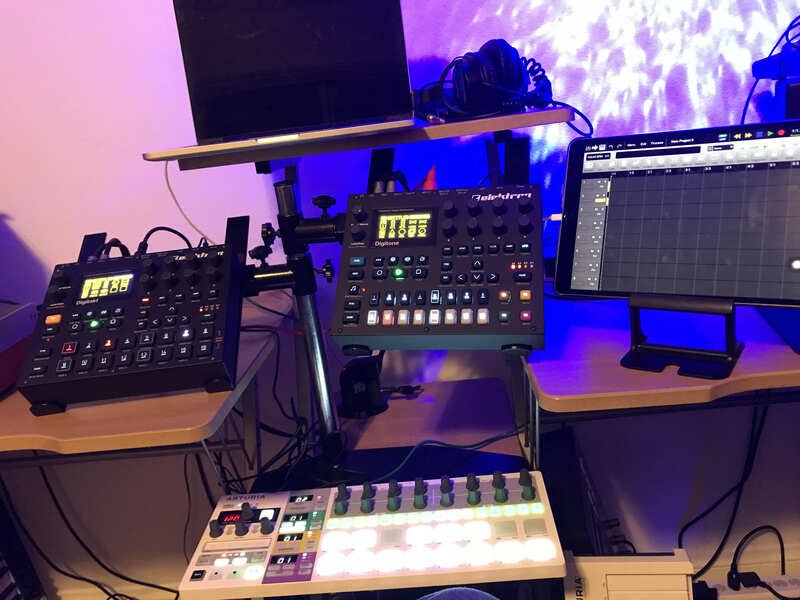 I just reconfigured my little closet studio around my two Elektrons and my iPad. A-3000 Version 2. Hours of fun. Ahhh the Autosynth effect served me well. How do you like the field kit? @99476598326 It’s very fun. Dc driver and envelope follower are a blast. CV radio is a nice addition and handy for coil pickups. Mixer section is convenient, if you need quiet it’s not for you. Haven’t had the opportunity to mess with the sensor section much, yet. Gotta make room for Yamaha MODX that’s backordered. 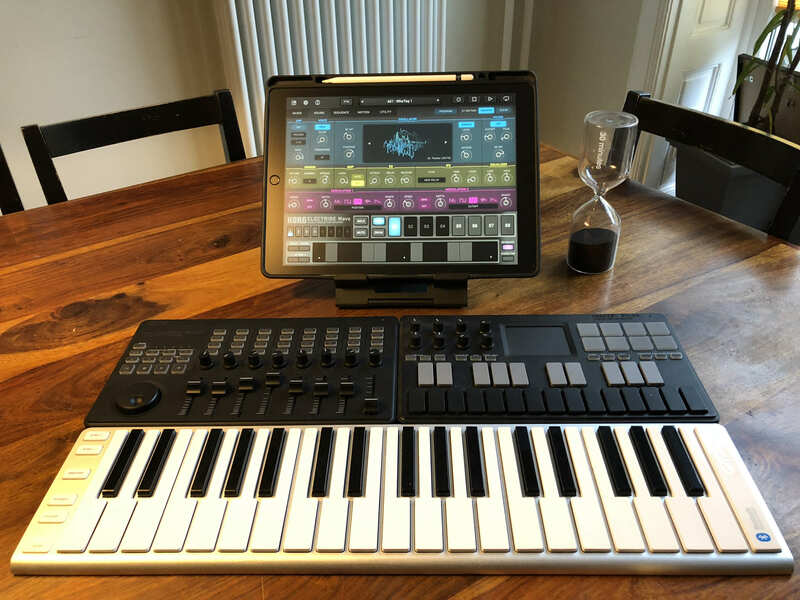 To me the mobility of iOS Music Production is just another benefit of the format, not it's only reason for being. 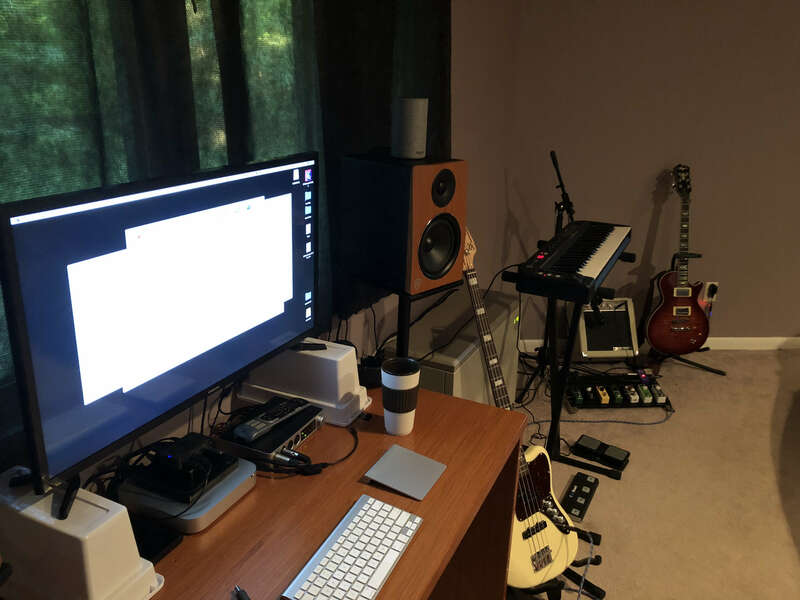 Usually I prefer the old school "studio proper" workspace, sitting at the desk, monitoring back & forth between my Sony MDR-7506's and the monitors, with everything set up ready to go. But it just takes 2 minutes to grab my interface (Tascam US 2x2) or iRigHD & headphones, put them in a backpack with my iPad and anything else I need and then I'm "going mobile" as Pete Townshend puts it.